Pop-ups can ruin your web experience by, well, popping up on the main web page. This can be very irritating and many times can lead to installation of malicious malware on your computer. Thus, many browsers such as Mozilla Firefox offers you automatic blocking or disabling of pop-up windows. However, at times, you do need to access certain pop-up windows and a disabled pop up window does not allow you to move ahead. If you are wondering how to disable a pop up in Firefox, the following instructions will prove to be easy. 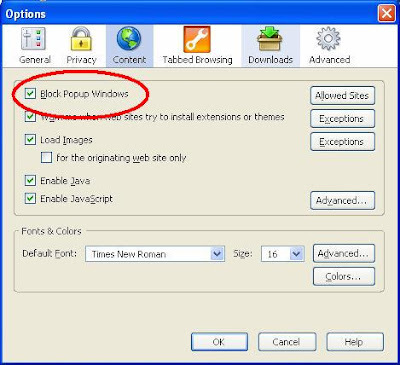 It is very simple to disable a pop-up blocker in Firefox. Open the Mozilla Firefox browser and go to the Tools menu and click on the options. or Just click on the three horizontal bars on the top right hand corner of your browser and click on the options. If you wish, you can click on Exceptions and type in the name of the websites you wish to exempt from automatic blocking of pop-up windows. That’s all you need to do to disable a pop-up blocker in Firefox.